A fight is escalating between Senate Democrats about taking prosecution out of the chain of command, a reform advocates argue is crucial but the Pentagon says is out of the question. 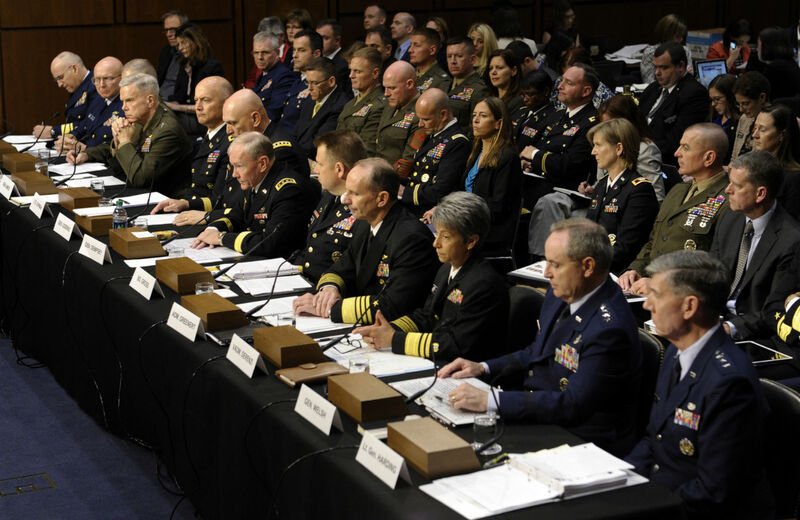 In June, a panel of square-shouldered military chiefs sat before Congress to account for the epidemic of sexual assault. Top brass promised “zero tolerance,” and Congress began crafting reforms tied to the defense spending bill it will send to the White House this year. Everyone says they are committed to reform—the Pentagon has been promising change for decades—but since the June hearing most lawmakers have backed away from one check that victims’ advocates argue is crucial and the military says is out of the question: authorizing military lawyers, rather than commanding officers, to decide which cases go to trial. That policy has been adopted by peer militaries including Germany and the United Kingdom, but in Congress it has opened a fault between Senate Democrats. Toeing the Pentagon line, Armed Services Committee heavyweights Carl Levin and Claire McCaskill are fighting to put down Kirstin Gillibrand’s measure granting military prosecutors authority in serious criminal cases, thus taking the chain of command out of the legal process. As it stands now victims must report crimes against them to their commanding officer, who then decides whether the complaint warrants a trial. Victims’ advocates argue that lawyers, not officers, should determine a case’s legality, and that preserving the command structure leaves victims vulnerable to retaliation and conflicts of interest, discouraging them from reporting crimes. The Armed Services Committee, led by Levin, killed Gillibrand’s corrective after she introduced it as an amendment to the Defense Authorization Act and instead passed a softer measure that upholds commanding officers’ convening authority. Since then Gillibrand has been trying to drum up a bipartisan coalition strong enough to reintroduce her amendment when the defense spending bill comes to the Senate floor as soon as next week. She needs fifty-one co-sponsors to open discussion, and so far has thirty-four, including Republicans Charles Grassley, Lisa Murkowski, Susan Collins and Mike Johanns. Pentagon policy is a hard-shell status quo, and where the chain of command is concerned, Levin and McCaskill are keen to preserve it. They argue that Congress is enforcing other measures to overhaul the system, and that removing the chain of command would in fact lower the rate of prosecution. That point emerged Thursday during a re-confirmation hearing for Joint Chiefs of Staff chairman general Martin Dempsey and vice chairman staff admiral James Winnefeld, who testified that commanders have pursued cases that civilian prosecutors declined, and won convictions. According to Winnefeld’s testimony, the Army found forty-nine cases in the last two years in which civilian lawyers declined to prosecute; commanders pursued the cases, leading to twenty-five convictions. The Marine Corps reported twenty-eight cases declined by prosecutors that commanders pursued to sixteen convictions. To McCaskill and Levin, this data indicates that empowering prosecutors would lead to fewer convictions. But the role of civilian prosecutors in criminal court is not comparable with military lawyers, who are not elected and work within the military legal system. It’s good that commanders added forty-one convictions, but that number vanishes into the gap between the 302 convictions won in 2012 and the 2,558 pursued. McCaskill maintained that the Senate is “making changes that will really impact the success of these cases” by reforming what happens “the moment the victim reports,” measures which include making retaliation a crime and requiring a senior officer to review all cases in which a commander declines to prosecute a sexual assault against the recommendation of his lawyers. Such instances are rare. What happens after a victim reports is critical, but few get that far. Only about 3,300 victims came forward in 2012, while an estimated 26,000 instances of “unwanted sexual contact” occurred. “We’re still having 23,000 victims who don’t feel the system is strong enough, objective enough, and transparent enough to even report,” Gillibrand said at the hearing. Taryn Meeks, a former Navy lawyer (judge advocate general, or JAG, in military terms) now the executive director of Protect Our Defenders, disagreed with McCaskill’s assessment. “The public eye is on commanders now, but what happens when the public shifts its attention? The system is so broken it will easily revert back to a time when commanders can sweep these issues under the rug,” she said. The fundamental question the debate raises is whether Congress retains the ability to enforce civilian control over the military. If Gillibrand rouses fifty-one co-sponsors, the floor debate will likely be heated. The House, which passed its defense bill last month with added protections for victims, harsher sentencing for perpetrators and no change to convening authority, would give the amendment a tougher reception. Some reform to the military’s justice system will pass, but whether it will be an effective overhaul or a half-measure remains to be seen. With 23,000 unreported cases a year, waiting to see if the Pentagon is as good as its word is a high stakes gamble. As Detroit nears bankruptcy, Michigan’s democracy is called into question.